DAEMON Tools Lite for Windows 10 - A comprehensive software tool for working with disk images. Implemented support for common extensions, including MDS, CUE, BIN, BWT. It can emulate up to four virtual drives, ensuring their correct operation in the OS environment while being used simultaneously. The program is able to save the user from the hassle associated with optical disks. The modern interface of the application is not overloaded with unnecessary elements; even a beginner will understand it. Runs in the background, curled up in the system tray. To access all functions, simply click on the icon. 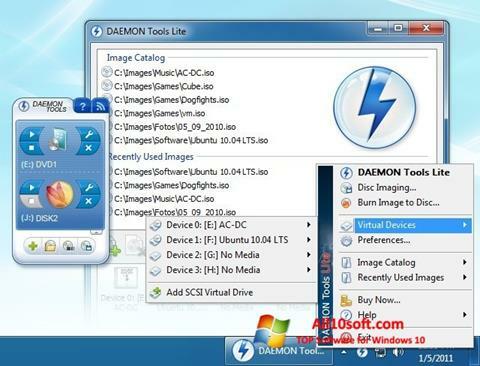 You can free download DAEMON Tools Lite official latest version for Windows 10 in English.